The Raja yoga mat has a lightly textured, tacky surface to prevent slipping. This is a 1/4” thick mat that provides excellent traction, extra density and ideal rebound. 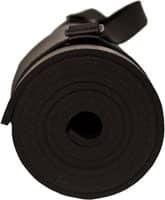 This yoga mat includes a completely detachable hook & loop (like Velcro) fastener harness, making it easy to store your mat and to transport your mat to and from class (thus eliminating the need for a mat bag). The Raja black yoga mat is the ideal power yoga mat, Ashtanga yoga mat, or mat for any other demanding yoga practice. This yoga mat also provides the stability and comfort needed for Pilates mat work. Internal, center threading provides exceptional strength and durability against tearing. This is a hand washable mat that is 24" x 72" and weighs approximately 5 lbs. The Raja black yoga mat is the ideal power yoga mat, ashtanga yoga mat, or mat for any other demanding yoga practice. 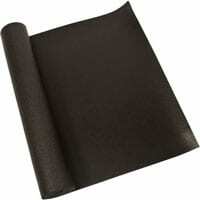 It is a lightly textured, dense, 1/4" thick mat that provides excellent traction. 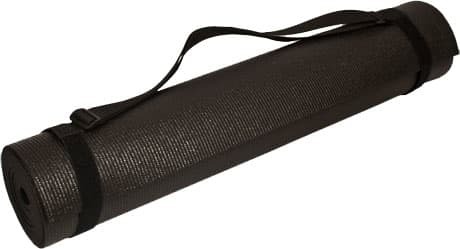 This yoga mat includes a completely detachable hook & loop (like Velcro) fastener harness, making it easy to store your mat and to transport your mat to and from class (thus eliminating the need for a mat bag). 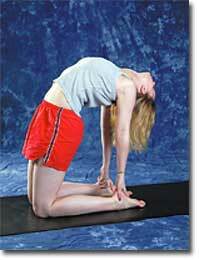 The Raja Mat also provides the stability and comfort needed for Pilates mat work. Provides extra density and ideal rebound. Includes harness for easy transportation and storage. Lightly textured, tacky surface to prevent slipping. Thickness: 1/4" (6.3 mm) - providing superior thickness for added comfort.